Michigan was a great breeding ground for CHUM jocks in the late '60s and early '70s. From 1968 to 1970, no fewer than three CHUM talents were discovered in the Wolverine State. In 1968 it was J. Michael Wilson, coming over from WKNR Dearborn. The following year, CHUM program director J. Robert Wood heard Tom Near doing the 6-9 p.m. shift at WKNR and by January 1970 he was doing the same shift at CHUM only this time as Tom Rivers. Also that month, another new voice arrived at CHUM from Michigan - his name was Johnny Mitchell and he came to Toronto after being on WKNX Saginaw and WGRD Grand Rapids. At CHUM, Mitchell inherited the midday shift which Bob Laine had been doing since August of 1968. Mitchell lasted a couple of years at CHUM, before moving back to the U.S. at KCBQ San Diego and at KHJ Los Angeles as Sonny Fox (CHUM was the only station where he called himself Johnny Mitchell). He left KHJ to partner with Lee Abrams at the "Superstar Radio Network." Fox spent the latter part of the '70s programming WRNO New Orleans and WYSP Philadelphia. He returned to the airwaves in the '80s, where for five years beginning in 1983 Fox teamed with Ron Hersey at WSHE-FM Miami to give that station its highest morning ratings ever. After a short spell in mornings at KHYI Dallas (Y-95), Fox returned to Miami in 1990 at WMJX (FM 102.7). He moved to WKIS Miami six years later and in 2002, moved to XM Satellite Radio in Washington, D.C., where he programmed two of the comedy channels. Fox is still at SiriusXM as of this writing (2017). 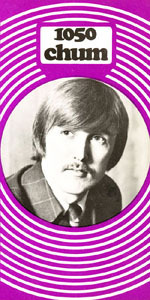 Fox/Mitchell got his start in radio while fronting his group "Jay Walker And The Jay Hawkers" on stages around Michigan. While moving across the state promoting his group's latest record he wound up in Saginaw at WKNX. While he wasn't seeing an on-air job at WKNX, he was offered a shift there and a radio career was born.